Bulgaria is continuing to maintain economic and financial stability and is taking active steps to achieve high economic growth, Prime Minister Boyko Borissov told World Trade Organisation director-general Roberto Azevêdo in talks in Sofia on February 27. The Prime Minister said that one of the priorities of the Bulgarian Presidency of the Council of the European Union is to work to strengthen confidence in the World Trade Organization and promote the multilateral trading system. 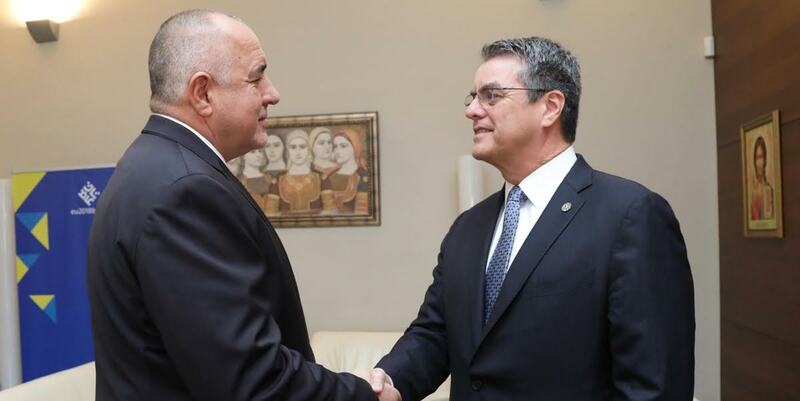 Azevêdo, who also held talks with Bulgarian President Roumen Radev, was in Sofia to attend an informal meeting of EU ministers responsible for trade, under the chairmanship of Bulgarian Economy Minister Emil Karanikolov. The European Commission is being represented by the Commissioner for Trade Cecilia Malmström. The informal meeting of EU trade ministers was holding two plenary sessions. The first plenary session was to focus on the prospects for the multilateral trading system. The Bulgarian presidency will initiate a discussion on a possible follow-up to the 11th Ministerial Conference of the World Trade Organization (WTO) held in December 2017.